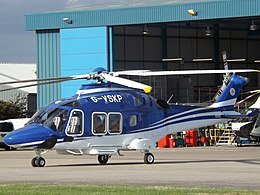 On 27 October 2018, an AgustaWestland AW169 helicopter crashed shortly after take-off from the King Power Stadium, the home ground of Leicester City Football Club in Leicester, England, United Kingdom. All five people on board – the pilot and four passengers, including club owner Vichai Srivaddhanaprabha – were killed. The Air Accidents Investigation Branch attributed the crash to a loss of yaw control owing to a failure of the tail rotor control linkage. Vichai frequently travelled to and from Leicester City's matches at the King Power Stadium in the helicopter, with the Leicester Mercury describing it as "a familiar sight for Foxes fans." On 27 October, the helicopter departed Fairoaks Airport in Surrey with the pilot and one passenger on board. It stopped at London Heliport to collect three additional passengers — Srivaddhanaprabha and two of his staff — before departing at 14:43 BST (13:43 UTC). It arrived at the Leicester City Football Club Training Ground on Belvoir Drive, 1.5 miles (2 km) south of the King Power Stadium at 15:58 BST (14:58 UTC). All on board disembarked and traveled by car to the stadium for Leicester's game against West Ham United. The pilot and one passenger returned after the football match concluded and then, as was usual, flew the helicopter to the stadium to collect Srivaddhanaprabha and his two staff. The helicopter was seen preparing to lift off from the pitch live on BT Sport, during a post-match broadcast. By this point, the coach carrying the West Ham team had departed, but some Leicester City staff and players were still in the stadium, while there remained fans of both clubs in areas outside. The aircraft was due to fly to Luton Airport. With Vichai, the pilot and three other people on board, the helicopter took off from within the stadium at approximately 20:37 BST (19:37 UTC). As the pilot turned the helicopter towards its en-route heading, the tail rotor control linkage broke, sending the helicopter into an uncontrollable spin. One witness described the aircraft falling "like a stone to the floor". It struck the ground in stadium Car Park E, about 200 metres (220 yd) from the stadium, and burst into flames. Two police officers attempted to rescue those in the helicopter but had to retreat due to the heat and flames. Investigators ruled out a suggestion of a collision with a police drone as a possible cause. The following day, Leicestershire Police confirmed that everybody on board had been killed in the crash and subsequent fire, and named the five fatalities. They were three Thais: club owner Vichai Srivaddhanaprabha and two members of his staff – Kaveporn Punpare and Nusara Suknamai, British pilot Eric Swaffer, and his Polish girlfriend, co-pilot Izabela Roza Lechowicz. There were no casualties elsewhere. The aircraft involved in the accident was an AgustaWestland AW169 helicopter, registration G-VSKP, c/n 69018, manufactured in 2016. It seated 10 people and weighed roughly 4,500 kilograms (9,900 lb). It was powered by two Pratt & Whitney Canada PW210A engines. The aircraft was owned by Foxborough and operated by Amadeus Aviation. This was the first crash and hull loss involving the AW169. The Air Accidents Investigation Branch (AAIB) opened an investigation into the accident. Italy's Agenzia Nazionale per la Sicurezza del Volo, representing the state of the manufacturer of the helicopter, and Canada's Transportation Safety Board, representing the state of the manufacturer of the helicopter's engines, provided assistance. Accredited representatives from Poland's State Commission on Aircraft Accidents Investigation and Thailand's Aircraft Accident Investigation Committee also provided assistance. The aircraft's Digital Flight Data Recorder was recovered on 28 October, having been severely damaged in the fire. It was transported to the AAIB's base at Farnborough, Hampshire, for downloading of data contained therein. The wreckage of the helicopter was transported to Farnborough on 2 November. A coroner's court was created to investigate the official cause of death for the passengers and crew of the helicopter. The investigation reported in the court revealed that there was minimal opportunity for any individuals who survived the initial crash to escape, or anyone to help those trapped. On 7 November, the European Aviation Safety Agency (EASA) issued an Airworthiness Directive, demanding checks of the tails of all AgustaWestland AW169 and AgustaWestland AW189 helicopters, as a precautionary measure. On 14 November, the AAIB released a Special Bulletin, outlining the progress of the investigation. A loss of yaw control was revealed as the cause of the aircraft crashing, with the reasons for the loss of yaw control not yet determined. The investigation is concentrating on the tail rotor system as a matter of priority. On 30 November, the EASA issued an Emergency Alert Service Bulletin requiring periodic inspection of part of the tail rotor system. This was made mandatory by an Airworthiness Directive issued the same day. On 6 December 2018, the AAIB published a second Special Bulletin. Investigators revealed that loss of control of the helicopter resulted from the tail rotor actuator control shaft (which controls the pitch of the tail rotor blades) becoming disconnected from the actuator lever mechanism that transmits the pilots' pedal inputs to control the helicopter's yaw. They have also revealed evidence of the normally stationary control shaft being spun by the tail rotor which caused the castellated nut holding the actuator lever in place to friction weld to its carrier, shear off its split pin and rotate off the threaded shaft. The locking nut and pin carrier were found loose in the tail rotor fairing and were bonded together. A duplex bearing that was designed to allow the control shaft to remain stationary (with the rest of the tail rotor assembly rotating around it) have been found to only allow a few degrees of rotation, with the races blocked up by a mix of burnt grease and metallic particles. Work continues to identify the cause of the damage observed to the duplex bearing and to establish its contribution to the failure sequence. Leicester City F.C. delegation in Thai AirAsia livery took off at the Don Mueang International Airport, to attend the memorial service of Vichai. Fans began to lay flowers and football shirts outside the ground the next morning. Shirts and scarves were also seen from other teams including West Ham United, Leicester City's opponent in the match prior to the crash. On 30 October, Leicester City opened a book of condolence, with an online version also available. In the immediate aftermath of the accident, some buildings were floodlit in blue as a tribute to the victims, including England's national stadium, Wembley. The Leicester City Foxes Foundation Charity was renamed The Vichai Srivaddhanaprabha Foundation in honour of the deceased chairman and owner. The 2018–19 FA Women's Championship match between Leicester City and Manchester United, scheduled for the day after the crash, was postponed out of respect for the victims. The ladies reserve league match against Derby County was also postponed. Leicester City's 2018–19 EFL Cup fixture against Southampton, which had been scheduled to take place at the King Power Stadium on 30 October 2018, and the 2018–19 Premier League International Cup fixture between Leicester City U-23s and Feyenoord Academy, were also subsequently postponed. The 2018–19 Belgian First Division B fixture between Oud-Heverlee Leuven, the second club owned by Vichai Srivaddhanaprabha, and Lommel, originally scheduled for 31 October, was also postponed. At the other Premier League football fixtures on Sunday, players wore black armbands, both for the crash victims and for Remembrance Day, though a few days earlier than Remembrance armbands are usually worn. Matthew Harding – Chelsea F.C. investor killed in a helicopter crash returning from a football match in October 1996. 2019 Piper PA-46 Malibu crash — a small plane crash that killed Argentine footballer Emiliano Sala on his return to the football grounds of Cardiff City F.C. in January 2019. ^ Steinberg, Jacob; Dodd, Vikram (28 October 2018). "Helicopter believed to be carrying Leicester City owner crashes after game". the Guardian. ^ "LIVE: Leicester City owner confirmed dead in helicopter crash". ^ a b "Club Statement: Vichai Srivaddhanaprabha". Leicester City F.C. 28 October 2018. Retrieved 28 October 2018. ^ a b "Leicester City confirm chairman's death". 28 October 2018 – via www.bbc.co.uk. ^ Steinberg, Jacob (28 October 2018). "Leicester City owner Vichai Srivaddhanaprabha confirmed dead in helicopter crash". the Guardian. ^ "Why Leicester City owner used a helicopter to travel to games". 28 October 2018. Retrieved 30 October 2018. ^ LLC, Airnav Systems. "AirNav RadarBox – Live Flight Tracker and Airport Status". AirNav Radarbox. ^ Jarvis, Jacob (27 October 2018). "Leicester helicopter crash: City football club owner's helicopter crashes outside King Power Stadium". Evening Standard. Retrieved 29 October 2018. ^ Beardsworth, Luke. "Leicester helicopter crash: Moment visibly shaken Jake Humphrey breaks news of crash on live TV". Leicester Mercury. Retrieved 29 October 2018. ^ a b c d "Leicester City owner's helicopter crashes leaving stadium". BBC News Online. Retrieved 28 October 2018. ^ Cullen, Ellie; Steelyard, Linda. "'Horrific scenes': Reaction to Leicester City helicopter crash". Leicester Mercury. Retrieved 28 October 2018. ^ "Leicester City helicopter 'did not respond to pilot's command'". BBC News. 14 November 2018. Retrieved 14 November 2018. ^ Hermesauto (28 October 2018). "Leicester City's Thai chairman Vichai Srivaddhanaprabha was on board helicopter that crashed: BBC". The Straits Times. Retrieved 28 October 2018. ^ a b c "Leicester City owner's helicopter crashes outside club's King Power Stadium". Sky News. Retrieved 28 October 2018. ^ a b c d "AAIB Bulletin S2/2018" (PDF). Air Accidents Investigation Branch. Retrieved 6 December 2018. ^ "Helicopter 'spiralled out of control'". BBC News. Retrieved 28 October 2018. ^ "Black box recovered as probe begins into cause of Vichai crash". The Thaiger. Retrieved 1 November 2018. ^ "G-VSKP". Helis. Retrieved 28 October 2018. ^ Martin, Dan (28 October 2018). "More about the £6.6m helicopter that crashed outside stadium". ^ "G-INFO search | Civil Aviation Authority". siteapps.caa.co.uk. Retrieved 28 October 2018. ^ Perry, Dominic (29 October 2018). "Flight-data recorder recovered from Leicester AW169 crash". London: Flight International. Retrieved 30 October 2018. ^ "Update on Leicester helicopter accident (G-VSKP)". Air Accidents Investigation Branch. Retrieved 29 October 2018. ^ "Leicester helicopter crash wreckage removed". BBC News. 2 November 2018. Retrieved 2 November 2018. ^ Association, Press (6 November 2018). "Leicester City crash victims 'had minimal opportunity to escape'". the Guardian. Retrieved 6 November 2018. ^ "Leicester City helicopter crash: Safety checks ordered". BBC News. 7 November 2018. Retrieved 7 November 2018. ^ O'Grady, Sean (28 October 2018). "Leicester helicopter crash: Flowers and scarves left in tribute as fans react in shock". The Independent. ^ "Leicester City helicopter crash: Book of condolence opens". BBC News Online. Retrieved 30 October 2018. ^ "Leicester helicopter crash victims named". BBC News Online. 29 October 2018. Retrieved 30 October 2018. ^ Owen, Dave (6 November 2018). "Leicester City announces change to charity to honour Vichai". leicestermercury. Retrieved 6 November 2018. ^ "Leicester-city-fans-in-'5,000-1'-walk-for-helicopter-crash-victims". 10 November 2018. Retrieved 12 November 2018. ^ "Thousands of Leicester City fans take part in tribute walk to remember chairman". Sky News. 10 November 2018. ^ "Leicester City helicopter crash – latest reaction". BBC Sport. 28 October 2018. Retrieved 28 October 2018. ^ "Leicester City helicopter crash: What we know so far". Sky News. Retrieved 16 November 2018. ^ Blackwell, Jordan (29 October 2018). "City confirm postponement of Southampton and U23s fixtures". Retrieved 30 October 2018. ^ "Club Statement: Vichai Srivaddhanaprabha". LCFC.com. 28 October 2018. Archived from the original on 28 October 2018. Retrieved 29 October 2018. ^ "OH Leuven-Lommel wordt uitgesteld naar 4 december wegens rouw" [OH Leuven-Lommel postponed to 4 December for mourning] (in Dutch). sporza.be. 30 October 2018. Retrieved 30 October 2018. ^ "OH Leuven v Lommel United". The Sportsman. Archived from the original on 2 November 2018. Retrieved 2 November 2018. ^ Fisher, Ben; Cook, Chris (28 October 2018). "Leicester City helicopter crash: owner believed to have been on board – latest updates". The Guardian. ISSN 0261-3077. Retrieved 28 October 2018.